The visual impact of the Jagged Edge is literally breathtaking. There is a collective gasp when it first comes into view over the crest of the hill, framed by tall conifers. From this distance, it looks like the prow of a futuristic glass rocket ship launching itself into space, a sleek arrow, a church spire or a jewel-like prism. I have visited Jagged Edge in the winter when the landscape was clothed in white, a magical time of year when commonplace ferns and spider-webs become works of art in silver filigree. Flames glowed red and orange in the massive double-sided fireplace, and the snowy mountains were painted pink in the sunset. 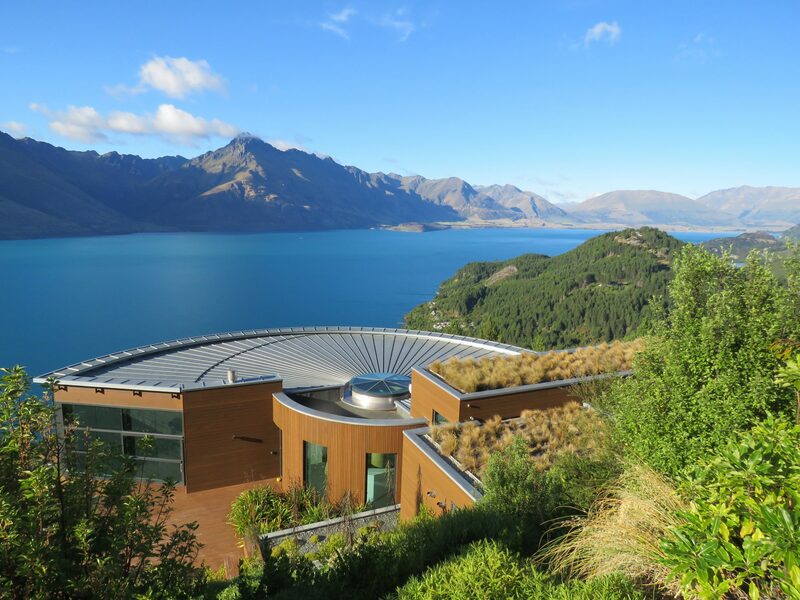 Now, at the height of the Central Otago summer, floating between the bleached blue sky and turquoise-jade Lake Wakatipu, Luxe Houses’ New Zealand flagship property appears even more surreal. There is a collective gasp when it first comes into view over the crest of the hill, framed by tall conifers. From this distance, it looks like the prow of a futuristic glass rocket ship launching itself into space. 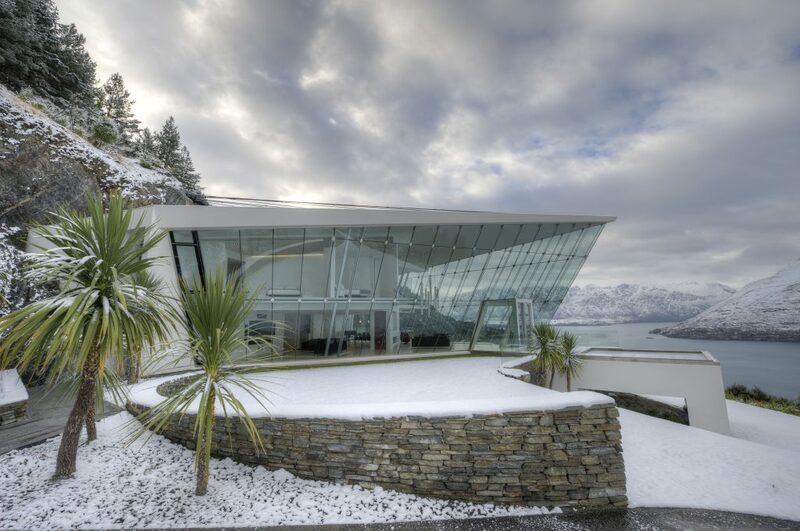 The sharp triangular structure of the property, with two walls embedded in schist base rock, defies the very concept of a house and challenges every rule of plumb. 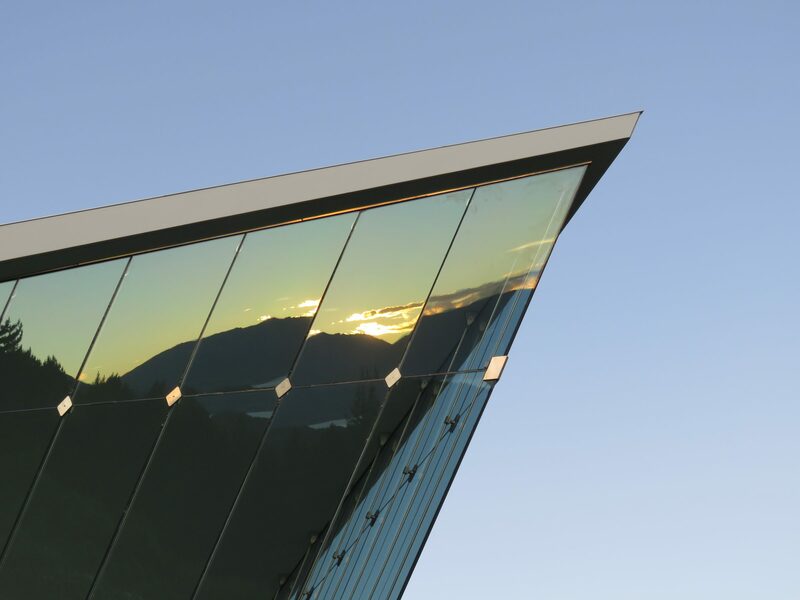 The glass walls tilt out from the base at an 18-degree angle, soaring to a lofty 9.2 metres at the apex. 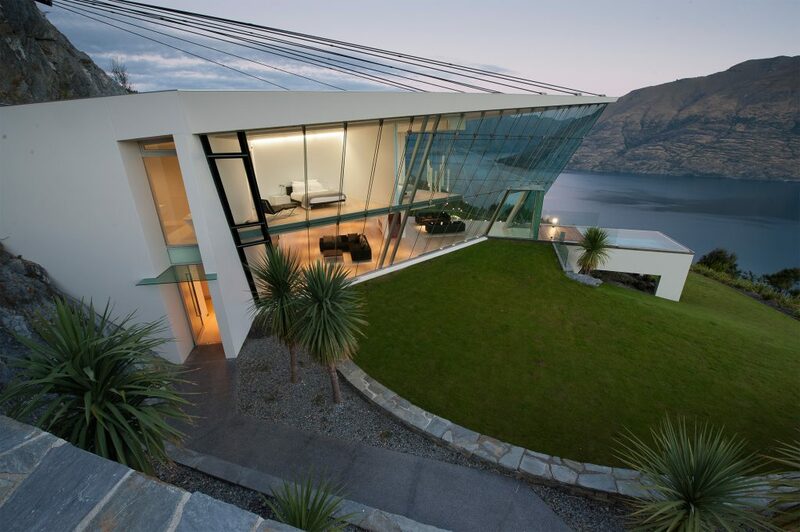 Side-on, the structure is so light and transparent it is almost invisible, allowing it to blend into the surrounding landscape. Launched on the ultra-luxury villa accommodation market in March 2016, Jagged Edge is secluded and secure, located at the end of a private road beyond two coded security gates. 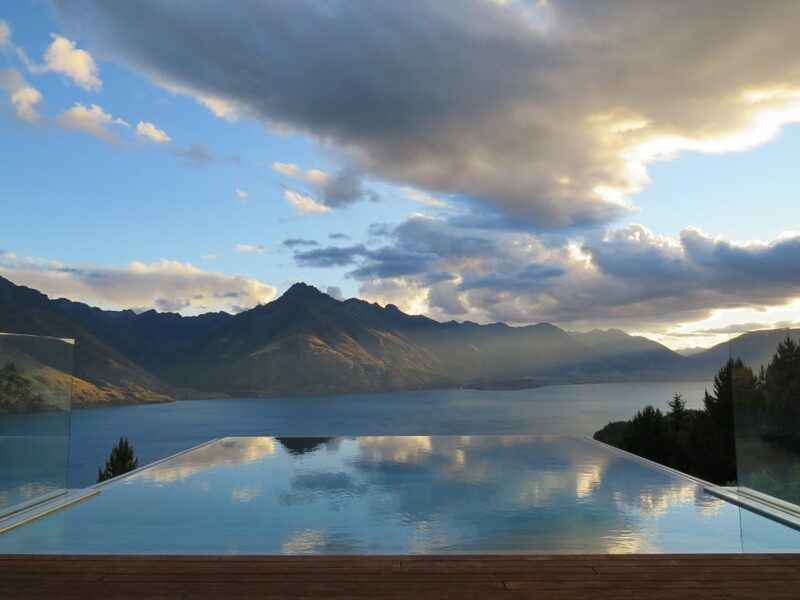 Although only 10 minutes from Queenstown, it feels as though we are on another planet. Once installed, guests need not see another soul until check-out apart from the dedicated VIP concierge, who will happily oblige any and every request to ensure a flawless stay. The Jagged Edge is built into the cliff and secured from above by 10 steel bars connected to anchors drilled 20m into the rock. Photo by Luxe Houses. Services tap into Luxe Houses’ extensive and highly respected network of professionals. Gourmet cuisine is delivered as required, or a celebrity chef and professional waiters can prepare an intimate dinner or cater a full-scale event. In-house luxury spa and beauty treatments, a personal trainer, or yoga instructor can be arranged. Also on the menu are private charter jets and helicopter transfers, yachts, launches and jet-boats, butlers, drivers, experienced nannies, guides and ski instructors. However, the house itself is a never-ending source of entertainment. The saw-toothed, indigo Remarkables, rising perpendicularly from Lake Wakatipu have always been the undisputed icons of the Queenstown skyline. Here, so close to Walter and Cecil Peaks, we can see the furrows and crevices in their glacier-gouged faces, and the hanging valleys left behind as the ice retreated. It is a spectacular display at sunrise and an even better show at sunset, when the reflections in the mirror-like walls and pool are dazzling, bringing the landscape right in. 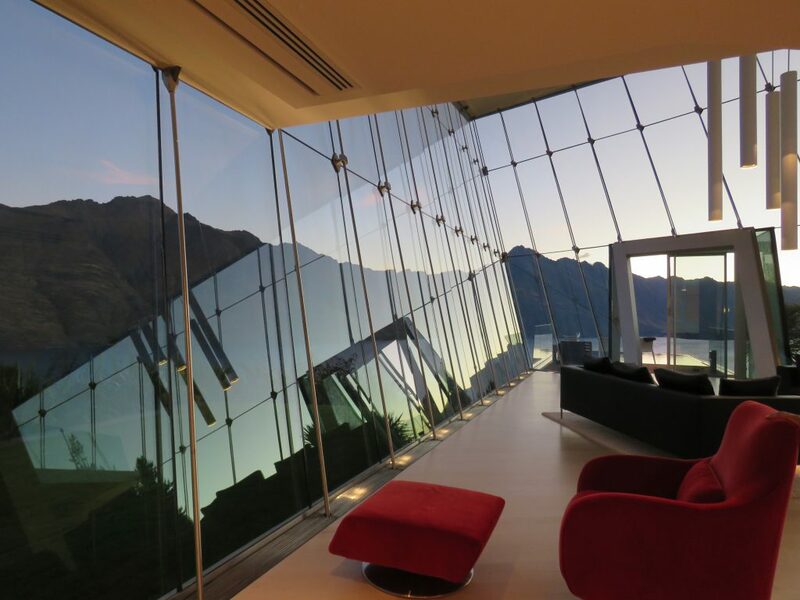 Looking back towards the house, the mountains and lake become kaleidoscopic: fragmented, distorted and duplicated by the glass panels. I touch them in the glass and bathe with them in the pool. 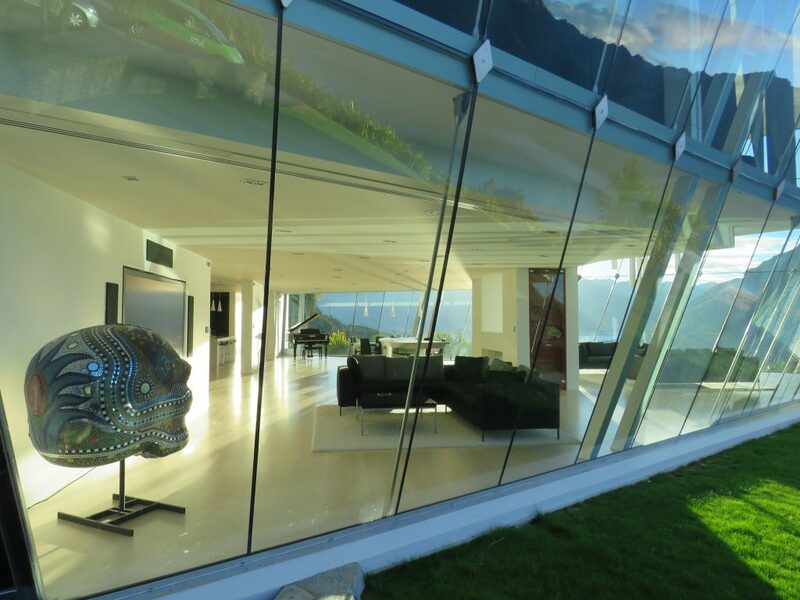 The interior design of the three-bedroom, four-bathroom property is almost entirely open plan, with views of peaks muscling their way into every room, dominating the field of vision. The owners have wisely demurred to the gargantuan scale of the natural landscape, keeping the décor deliberately understated, posing no impediment or distraction to the 270-degree panorama. With its pale, knotless timber flooring, the overall effect of Jagged Edge is one of edited elegance and clean, uncluttered lines. It’s a restful place, devoid of fussy detail and decoration. That said, I take note of some well-chosen dramatic lighting features inside the house, made all the more effective by their minimalist surroundings: a colourful glass and mosaic head lit from within, purchased by one of the owners from Mexico at the Día de los Muertos festival, stands in a corner of the entertainment area, and an imposing glass sculpture in the shape of a kiwi bird extends the height of the stairwell and beyond. Seven white tubes are suspended from the ceiling at irregular heights in the atrium, and floor lights illuminate the glass walls at night, accentuating their height. A superbly well-equipped, gleaming black and white galley kitchen located at the rear of the house is designed with entertaining in mind. It features a 4-metre white Corian island and bench with two full-sized dishwashers, a huge electric oven with five Miele gas hobs, and a myriad of appliances, dinnerware and cookware. For coffee addicts, there’s a top-of-the-line built-in Miele coffee machine and stand-alone Nespresso with a wide selection of capsules. Of course, the kitchen has a full view of the mountains and lake. Behind a tall, opaque glass door off the living area is an architectural masterstroke. Tunnelled deep into the schist bedrock behind the house, there’s a wine cave that keeps the selection of local, New Zealand and imported wines at a constant 13 degrees Celsius. Quartz veins dissect the silver-grey schist and twin eagles guard the stacked stone entranceway. Dining, living, family and entertainment zones occupy the rest of the ground floor, a sun-filled, airy space beneath a soaring floor-to-ceiling atrium. The comfy black leather couch in front of the 103-inch Panasonic plasma television with state-of-the-art Sonos sound system is a popular spot. Weighing 230 kilograms, the television is mounted flush with the wall and has its own custom-designed cooling system. But the pièce de résistance is the 3.7 metre long sickle-shaped bar, which rises up from beneath the timber floor, complete with lights and stools. Just when I think I have witnessed everything the house has to offer, the Yamaha grand piano begins to play a symphony — all by itself. All this tech is not only aesthetic flourish. When the 6 x 5-metre stainless steel pool is not in use, a solid cover slides across the pool from beneath the decking. Activated by a keypad at the door, the water level lowers itself automatically so that the cover is recessed below the edge of the pool, safe from wind gusts. The temperature can be controlled precisely from anywhere in the world. Similarly, an ultra-high-tech but easy-to-operate house-management system controls all functions by way of iPads and touch panels beside the doors, and a master switch at the front door saves time and energy on arrival and departure. To conserve even more energy, smart technology allows the house to be switched to ‘unoccupied’ mode when empty. The bedrooms, ensuite bathrooms and upstairs sitting room float above the ground floor on a mezzanine. The master bedroom – with its slat bed perched on a platform covered in white Baksana linen, the lightest of down duvets, and a cosy possum throw rug – is palatial and luxurious in the extreme. A bright red recliner and footrest face arguably the best view in the house. Electric blinds and a wall appear at the touch of a button, transforming the sunlit, open space into a cosy boudoir at night – but I sleep with the blinds and wall open for fear of missing a millisecond of the scene. Sunrise has me bounding out of my sumptuous bed as soon as the first tinges of dawn begin to illuminate the black crags of the Remarkables. The adjoining bathroom is a study in minimalism with pure white, high-gloss porcelain tiles on floor and walls. A glass-walled, walk-in double shower with twin faucets at each end takes up almost the full length of the room. A pair of Villeroy & Boch basins sits on a glass-top, wall-hung vanity with soft-close drawers well stocked with fine toiletries. 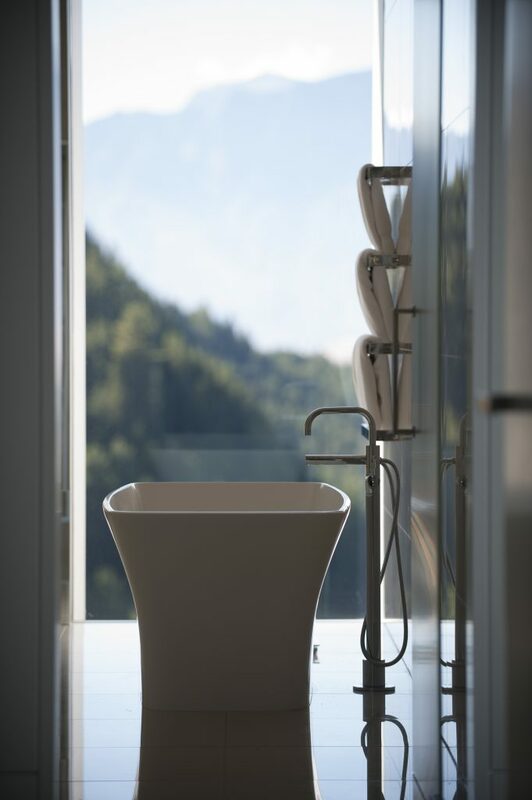 The white, freestanding Victoria & Albert bath has a stunning view of the mountains through a floor-to-ceiling window. Opaque glass storage cabinets built into the wall are stacked with even more toiletries and white Baksana towels. We lose track of time here and set our clocks by the Lady of the Lake – the historic steamer TSS Earnslaw – as she plies the waters of Lake Wakatipu en route to Walter Peak Station opposite, puffing smoke as the firemen stoke her furnaces. 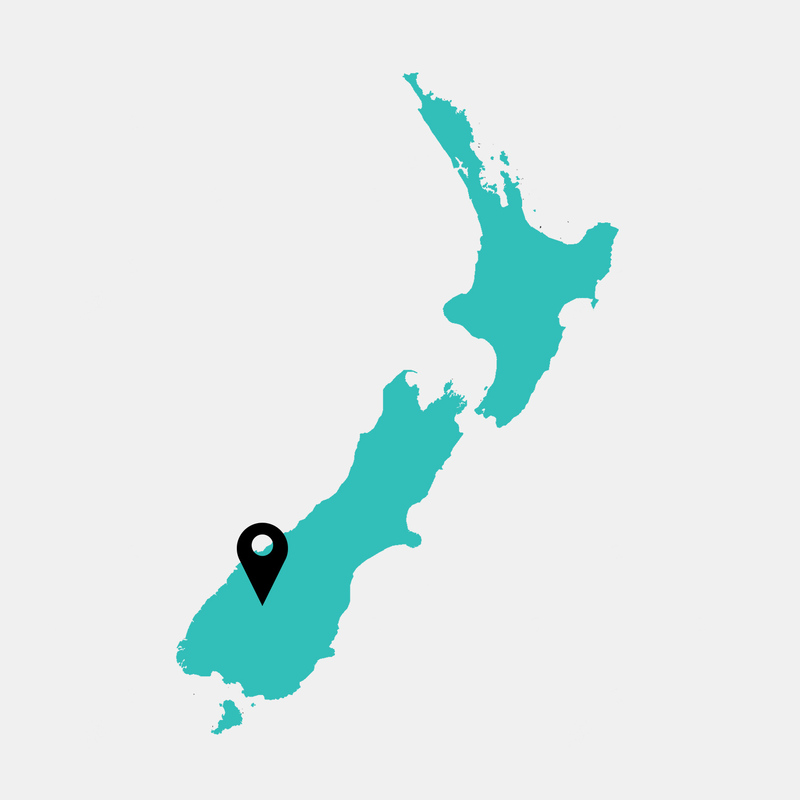 The lake is New Zealand’s longest, its third largest, and is also very deep, with its floor below sea level. At 8-10 degrees Celsius, the water is icy-cold year-round, so the spa pool at Jagged Edge is a popular place to be after a brave dip in the lake. We while away many hours here, arms draped languidly over the sides, drinking in the view and a glass or two of chilled Terra Sancta rosé from Bannockburn. 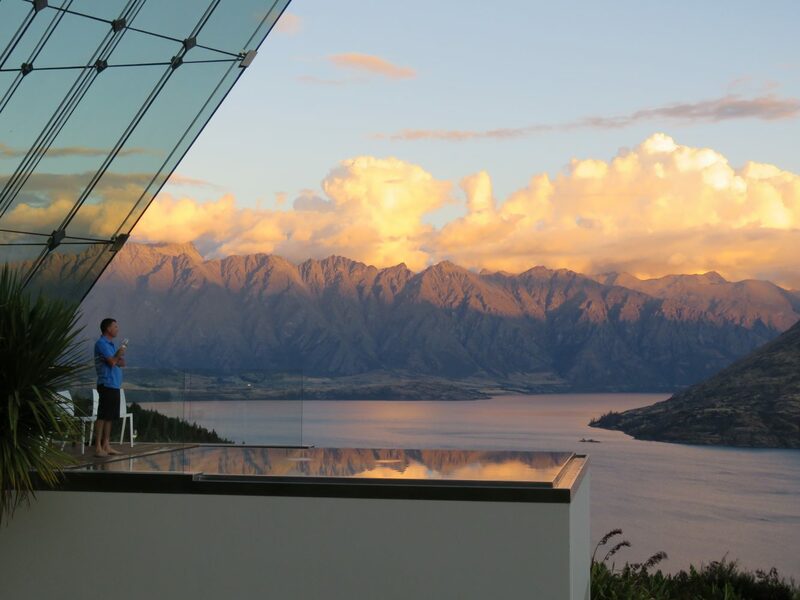 At NZ$5000 a night, the three-bedroom, four-bathroom Jagged Edge is among New Zealand’s most expensive and exclusive private holiday accommodation opportunities. For an extra NZ$4000 a night, just a short stroll away down a pretty pebbled path is an equally palatial five-bedroom, six-bathroom guesthouse with a heated swimming pool, spa pool, sauna, gymnasium, and full kitchen – not to mention a living area with huge wrap-around decking and the same jaw-dropping view as the mothership up the hill. 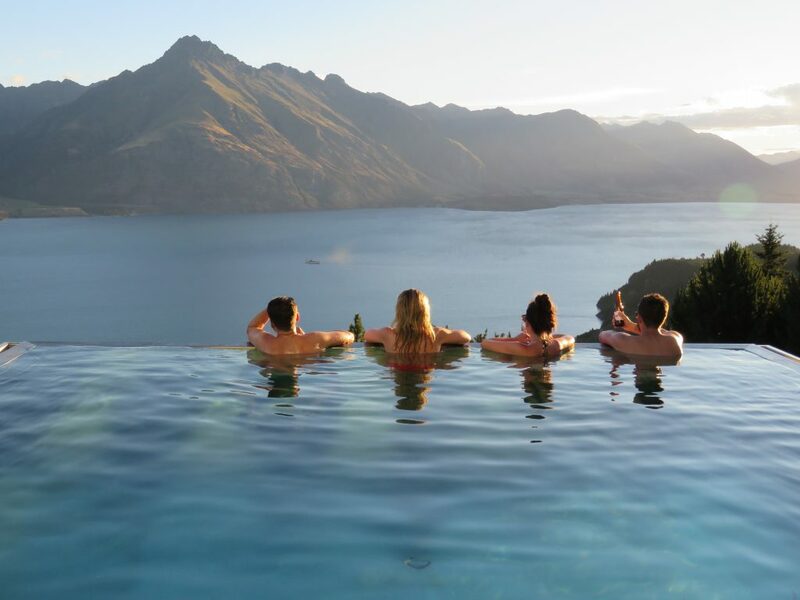 Air New Zealand flies to Queenstown direct from Christchurch, Auckland, Wellington, Sydney and Melbourne. JUCY Rentals assisted with transport for this story. Justine Tyerman was a guest of Luxe Houses at the Jagged Edge.